Among DiCamillo’s many gifts as an author is the good sense not to pander to children. In Raymie Nightingale she takes on the themes of abandonment and betrayal. Each of the story’s main characters, Raymie Clarke, Louisiana Elefante, and Beverly Tapinski, is dealing with some form of betrayal. Beverly, a tough girl with all the answers and some handy skills (like lock-picking) turns to revenge fantasies. Innocent Louisianna, filled with “feathers and regrets,” resorts to denial. Poor Raymie, our quintessential anti-hero, who is baffled by life and deeply hurt by her father’s recent, middle-of-the-night skulking-off with a dental hygienist, believes she can reverse betrayal through perseverance and determination. Raymie has a plan: win the 1975 Little Miss Central Florida Tire contest. The fame and notoriety that will follow will surely bring her father back. To win she needs a talent and signs up for baton twirling lessons. Here she meets Louisiana, another determined contestant, who believes that the $1,975.00 winnings will be enough to keep her out of the county home¾and Beverly, who intends to sabotage the stupid contest. What a perfect plot set-up: two friends competing for a common goal and a third dead-set on derailing it. But DiCamillo, as always, takes the plot less traveled. These kids, like most of DiCamillo’s indelible characters, are not out of central casting. They are quirky, innocent, plucky, and desperately in need of strong adult supervision. DiCamillo provides none. Beverly’s father moved to New York City, and her mother (DiCamillo heavily implies) physically abuses Beverly. Louisiana’s parents are both dead, and she and her granny live in an unheated house and eat pilfered canned tuna for supper. On good days. On bad days they go hungry. At least Louisiana has Granny looking out for her, even if Granny is a tad paranoid and employs questionable parenting methods. As for Raymie, her father’s departure has left her mother sitting in the sunroom, nearly catatonic with grief. Raymie’s father’s secretary, Mrs. Sylvester, believes all ills can be soothed with candy corn. The “crazy as a loon” and (from the reader’s standpoint) somewhat shadowy neighbor, Mrs. Borokowski, drops dead unexpectedly half-way through the book. And Mr. Staphopolous, Raymie’s life-saving instructor, has left town with his life-saving dummy Edgar, first gifting Raymie with the inscrutable wisdom that she must be a problem-solver not a problem-causer, and importuning her to isolate her objectives, offering no instructions on how to do either. Everyone, it seems, is leaving Raymie. 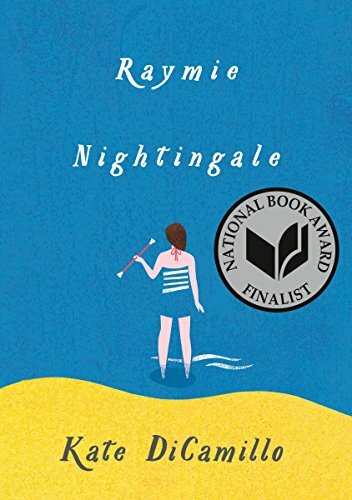 Much in life overwhelms and confuses Raymie, which might leave some readers confused as to why DiCamillo chose her as the titular character and not one of her two vastly entertaining and more grounded friends. Perhaps it’s because DiCamillo recognizes that many of her younger readers feel equally overwhelmed. Raymie is a thinker and seeker. (Have you ever wondered what it feels like to have a fully inflated soul? Raymie has.) In Raymie, DiCamillo offers readers a heroine who doesn’t have all the answers, and doesn’t let that stop her. Besides possessing a talent, Little Miss Central Florida Tire contestants must have performed three good deeds. Raymie cannot think of even one. Mrs. Sylvester offers Raymie candy corn and suggests that she read “a suitable book” to residents at the local nursing home. Raymie selects a library book: A Bright and Shining Path: The Life of Florence Nightingale. Raymie arrives at the Golden Glen nursing home and almost immediately her nerves unravel, the good deed is abandoned, and she hightails it out, leaving the book behind. This event, perhaps a tad casually from the reader’s standpoint, incites the plot and the first of several ill-advised decisions on the part of the three girls, which result in a series of bizarre misadventures (witnessed by more wacky adults). The plot feels somewhat disjointed, but DiCamillo manages to draw the book to a highly satisfying end. Betrayal and abandonment are at the heart of this novel, and DiCamillo does not spare readers their effects, even as she entertains us with witty dialogue, tender moments, and moral musings. The betrayal that each girl suffers sets this plot in motion, but it is their trust and friendship that brings them resolution and growth.